Dr. Saniuk is originally from Omaha and has spent all of his life in this area. 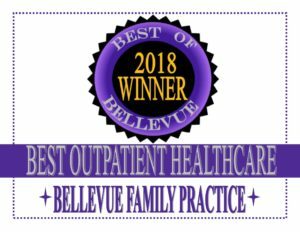 He completed his family practice training at Creighton University Medical Center and from there went on to found Bellevue Family Practice in 1983. He chose Bellevue because he was familiar with the area and the people who reside here. He liked the community and wanted to offer local healthcare. Dr. Saniuk has a strong sense of stewardship to the people of this area and enjoys knowing many of his patients personally. Dr Saniuk is a board certified Family Practitioner. He recently received additional training and became Certified in Advanced Bioidentical Hormone Practitioner in Hormone Replacement Therapy for men and women. He continues his education in hormones and preventative medicine with some of the best authorities in the field. Dr Saniuk is an avid runner and of course a big Nebraska athletics fan, you may see him at many of the events cheering them on. His family includes wife Kathy, and 2 grown children Mike and Christine, who works along side him as a Physician Assistant and two grandchildren, Dex and Clara.